He should have been a great philosopher, said Mrs. Ramsay, as they went down the road to the fishing village, but he had made an unfortunate marriage. My Vintage Classics edition of To the Lighthouse comes in at 224 pages, including the introduction by Helen Dunmore. It would be easy to write a book twice that length about it. My first completed Woolf was Mrs Dalloway, after two unsuccessful attempts at The Voyage Out neither of which made it past the first couple of pages. I described Dalloway as “an easy and effervescent read that brims with life”, which surprised me because I’d expected something rather difficult and forbidding. Somehow despite that experience I was still daunted approaching To the Lighthouse. It’s curious how much a book’s reputation can be a barrier to it. Lighthouse opens with the sprawling Ramsay family on holiday in Skye. Mr Ramsay is a philosophy professor, well regarded but perhaps falling slightly from fashion. His wife, Mrs Ramsay, is an extraordinarily beautiful woman largely unaware of her own beauty and who frankly could be Mrs Dalloway after some slightly different life choices. With them are their many children and guests, most notable in memory their youngest son James who has set his heart on going to the lighthouse the next day and is cruelly disappointed by indifferent adults commenting that the weather will forbid it. Among the guests are Lily Briscoe, a self-doubting amateur painter who may have genuine talent; Charles Tansley, an abrasive young man insecure by reason of his impoverished background; Augustus Carmicheal, a minor poet. I could pick any of several themes to discuss, but the one that stands out for me as I write this today is the question of what makes a life worthwhile. For James the answer is simple – the much promised trip to the lighthouse. He has the relentless focus of a small child. His whole hopes are invested in that one thing and yet he has no influence at all on whether it happens. Others’ dreams are more complex, though perhaps no more within their power. Mr Ramsay obsesses on how his work will be remembered by posterity. He’s a vain man, his success and praises to date insufficient bulwark against his ever-encroaching insecurity. He knows his most recent book was not his best. The marriages that happen do so without her help, those she seeks to bring about come to nothing. Her children’s happiness in the case of James can be dashed with a harsh word from the bumptious Tansley, and in the case of the older children is moving beyond her reach. Her husband’s dependence on her reassurance is a sign of a smallness in him, a truth she tries not to recognise. Universities and people wanting him, lectures and books and their being of the highest importance—all that she did not doubt for a moment; but it was their relation, and his coming to her like that, openly, so that anyone could see, that discomposed her; for then people said he depended on her, when they must know that of the two he was infinitely the more important, and what she gave the world, in comparison with what he gave, negligible. But then again, it was the other thing too—not being able to tell him the truth, being afraid, for instance, about the greenhouse roof and the expense it would be, fifty pounds perhaps, to mend it; and then about his books, to be afraid that he might guess, what she a little suspected, that his last book was not quite his best book (she gathered that from William Bankes); and then to hide small daily things, and the children seeing it, and the burden it laid on them—all this diminished the entire joy, the pure joy, of the two notes sounding together, and let the sound die on her ear now with a dismal flatness. And yet. What marriage is perfect? We see inside the Ramsay’s thoughts and so we see their failings, but that’s not the whole story. There’s the broader picture too: husband and wife; parents and children; the noise and chaos and love of a large family. The Ramsays are enviable, even if they don’t know it. From her interior monologues it’s clear that Mrs Ramsay is intelligent, perhaps more so than her husband. She’s alive to beauty and is psychologically astute, but she has no outlet for any of it which is why she spends her days trying to pair up others perhaps so that by replicating her choices they validate them. BUT WHAT HAVE I done with my life? thought Mrs. Ramsay, taking her place at the head of the table, and looking at all the plates making white circles on it. Lily Briscoe isn’t a beauty, which in Edwardian Britain would generally be a distinct disadvantage save that Lily’s ambitions lie in her art. She wants to capture a relationship between objects, to solve a problem in a painting, yet doubts she has the ability. Tansley crushes her with a cruel remark that women can’t write or paint. Her confidence is so fragile he dents her even though even he doesn’t seem to believe what he says and in any event plainly knows nothing of either. She can’t bear anyone looking at her canvas. Every sign in the book points to Lily having talent, but nothing supports her in it. She’s a woman; she doesn’t have the luxury Mr Ramsay has of a Mrs Ramsay to calm her fears. Still, she persists. Mr Ramsay wants immortality from his work; for Lily Briscoe the work itself is enough and she just wants to be true to her vision. The aging Mr Carmicheal meanwhile finds himself somewhere between the two, becoming recognised as a famous poet but seemingly just as comfortable as he was when uncelebrated. So she looked over her shoulder, at the town. The lights were rippling and running as if they were drops of silver water held firm in a wind. And all the poverty, all the suffering had turned to that, Mrs. Ramsay thought. The lights of the town and of the harbour and of the boats seemed like a phantom net floating there to mark something which had sunk. So some random light directing them from some uncovered star, or wandering ship, or the Lighthouse even, with its pale footfall upon stair and mat, the little airs mounted the staircase and nosed round bedroom doors. But here surely, they must cease. Whatever else may perish and disappear what lies here is steadfast. Here one might say to those sliding lights, those fumbling airs, that breathe and bend over the bed itself, here you can neither touch nor destroy. Upon which, wearily, ghostily, as if they had feather-light fingers and the light persistency of feathers, they would look, once, on the shut eyes and the loosely clasping fingers, and fold their garments wearily and disappear. And so, nosing, rubbing, they went to the window on the staircase, to the servants’ bedrooms, to the boxes in the attics; descending, blanched the apples on the dining-room table, fumbled the petals of roses, tried the picture on the easel, brushed the mat and blew a little sand along the floor. At length, desisting, all ceased together, gathered together, all sighed together; all together gave off an aimless gust of lamentation to which some door in the kitchen replied; swung wide; admitted nothing; and slammed to. In the third section the family return, some ten years later. War and illness have reduced their number, and their relationships have shifted accordingly. Mr Ramsay, tyrant of the first section through his own need rather than any cruelty, is both reduced and yet made better too. He takes James to the lighthouse, praises him for how he manages the tiller on their boat. He has learned to make space for others. He is human, as are they all. Grant of 1streading reviews it here. I had the advantage of not knowing a major story development around the half way mark of the novel and my ignorance definitely enhanced its impact. Grant assumes (fairly) that most readers are probably aware of the broad thrust of the story and so discusses that element in his first paragraph. I chose not to since I figured if I didn’t know it others might not, but by taking knowledge of the story as a given Grant does give himself more freedom to discuss some fairly key themes which I wasn’t able to explore here as much as I’d have liked. Grant’s also spot on in saying that there’s no real sense here of the Isle of Skye as a place, but then place isn’t really Woolf’s focus. With this intensity of character and emotion, a certain shallowness of geography isn’t a serious flaw. On a wholly unrelated note, until I ran a spellcheck on this post I honestly always thought elegiac was spelled elegaic (which still looks right to me on the page). I also thought it was a hard g (which is still how it sounds inside my head). Such are the perils of being largely self-educated. It rather makes me sympathise a bit more with poor Tansley. Oh! thought Clarissa, in the middle of my party, here’s death, she thought. Mrs Dalloway is perhaps the poster-child for high modernism and stream of consciousness fiction. As a result, for years I had the impression it was an austere and technically demanding novel. The reality is quite different. Mrs Dalloway is an easy and effervescent read that brims with life. Better yet, it’s not perfect. It’s a snobbish book which is a definite flaw, but which here is no bad thing because it would be terribly off-putting if it actually were flawless. Clarissa Dalloway is an upper middle class society hostess. She’s married to a slightly dull and only moderately successful cabinet minister whose career has reached its peak and who will never see truly high office. On one level the entire novel takes place within a single day as Clarissa prepares for a party she’s hosting that evening. On another level it ranges across time, because while our bodies can only exist in the present our minds are constantly travelling to remembered pasts and imagined futures. The novel opens with Clarissa’s viewpoint, but skips effortlessly to other characters’ perspectives – like a skimming stone on a sea of consciousness. Clarissa is concerned with the party and with old memories stirred by the unexpected visit of an old suitor, Peter. He’s in London to arrange a divorce so he can remarry, but seeing Clarissa opens old doors for him too and invites comparisons between his new love and his old. The story spirals out. Septimus Smith is a shell-shocked war veteran hallucinating dead friends to the dismay of his young Italian wife Lucrezia. She does her best to calm him, but his experiences and terrors are utterly beyond her experience. Meanwhile Sally Seton, Clarissa’s girlhood friend, is in town. She’s no longer the daring and unconventional free-spirit Clarissa once knew but now a settled mother of five. Their various ages, genders and social positions differ; the connecting thread is life. Bond Street fascinated her; Bond Street early in the morning in the season; its flags flying; its shops; no splash; no glitter; one roll of tweed in the shop where her father had bought his suits for fifty years; a few pearls; salmon on an iceblock. “That is all,” she said, looking at the fishmonger’s. “That is all,” she repeated, pausing for a moment at the window of a glove shop where, before the War, you could buy almost perfect gloves. And her old Uncle William used to say a lady is known by her shoes and her gloves. He had turned on his bed one morning in the middle of the War. He had said, “I have had enough.” Gloves and shoes; she had a passion for gloves; but her own daughter, her Elizabeth, cared not a straw for either of them. For me, there’s both a truth and an elegance to that prose. Clarissa’s attention moves seamlessly from a glove shop to Uncle William to Uncle William’s death back to gloves and then on to her daughter Elizabeth. It’s thought as river, flowing and eddying and never quite repeating. Clarissa, who “knew nothing; no language, no history; she scarcely read a book now, except memoirs in bed;” is full of life and fascination with the world “to her it was absolutely absorbing; all this; the cabs passing;” but she has little outlet for any of it and it’s not clear now if she’d even want one. It’s evident that she once loved Sally Seton, and there’s no sign she felt anything like the same emotional pull to either her husband or Peter (or any other man), but her only choice was between the men on offer. Sally Seton’s choices weren’t much better, and while she seems happy enough the contrast between the freedom she once embodied and the respectability she’s since embraced is a painful one. Nobody here has quite captured their youthful dreams, but then again who does? Septimus too seems closer to his dead friend Evan than to his living wife. The past overwhelms him; the choices not taken or denied by circumstance. Better to be Richard Dalloway whose career may not be what he’d once hoped but who has done his best and is content with the now and not the then. Existence here is a brief but blazing thing; we are most alive when we let the world in raw and immanent. In one of the novel’s most dazzling sequences Clarissa’s daughter rides on the top deck of a bus feeling a sense of liberation after a stultifying lunch – it’s an entirely quotidian experience yet here vibrant and real because of the directness with which she lives it free as she is of the weight of recollection that holds down her elders. However, at times there’s a definite air of condescension. Septimus reflects, “it might be possible that the world itself is without meaning”, but for Woolf that doesn’t appear to justify a poor choice of wallpaper. Status is among the book’s concerns and within the fiction it’s clear both that Clarissa is a snob and that other characters see her that way, but that doesn’t innoculate the wider novel from sharing its primary character’s chief flaw. Mrs Dalloway is a snob, and Mrs Dalloway is a snobbish novel. All the same, that one day should follow another; Wednesday, Thursday, Friday, Saturday; that one should wake up in the morning; see the sky; walk in the park; meet Hugh Whitbread; then suddenly in came Peter; then these roses; it was enough. After that, how unbelievable death was ! – that it must end; and no one in the whole world would know how she had loved it all; how, every instant . . .
Grant of 1streadingblog just reviewed this himself, which is very timely. His excellent review is here. Otherwise, Kaggsy of Kaggsy’s Bookish Ramblings (a lovely blog name by the way) reviewed Mrs Dalloway’s Party which is a related collection of short stories including the original first chapter of this novel and viewpoints of other characters on the party itself. That review is here. I’m sure there are many more out there, so as ever please let me know what I’ve missed in the comments. Edit: I meant to link to my own previous Woolf review, of her Jacob’s Room. My review of that is here. Through a prism of tears the blue ink becomes the sea. The text becomes dissolved in disquiet; the tears, the waves, the melting mast and quaking bay and lighthouse, the spreading blot. It’s a troubling start to the novel. Jacob’s Room was published in 1922, a time when the memory of the Great War would still have been fresh both for Woolf and her readers. It’s set pre-war, and shows the development of a young man named Jacob Flanders (an ominous surname if ever there was one). Jacob grows up in Cornwall, goes to university in Cambridge, lives in London for a while, takes a holiday in Greece indulging his love of the Classics. He has friends, lovers, family, a life. It would have been nearly impossible for any contemporary reader not to be aware of what was waiting for Jacob and his generation. Jacob’s Room looks at first like a Bildungsroman, Jacob’s coming of age tale, but many of Jacob’s generation never got to come of age. The Bildungsroman typically ends with the protagonist assuming their adult place in the world, putting aside their youthful errors and misunderstandings and finding maturity and with it a realisation of their burgeoning potential. The gas, the trenches, the machine guns, bayonets and artillery fire make a complete mockery of all that. Woolf is of course one of the great Modernist writers, a description which probably does more to put off readers than anything else one could say of her. Jacob’s Room is a Modernist novel. The reader comes to know Jacob not so much directly as indirectly, through how others describe him, through places he’s been or seemingly unimportant incidents in his life. 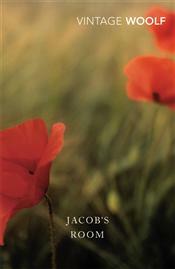 While Woolf occasionally reports Jacob’s speech directly or describes his thoughts it’s rarely anything revelatory. To the extent you piece Jacob together, you do so through the impression he leaves. I noticed when preparing my notes for writing this that Woolf uses a particular phrase twice, near the beginning and again near the end of the novel (the second example is quoted near the end of this piece). Woolf writes “It is no use trying to sum people up. One must follow hints”. That’s the essence of her portrait of Jacob, but it’s also of course true of how we remember people more generally. When I remember my grandparents I don’t think of important conversations we had or moments of great drama, I remember resonant fragments. I remember waking up before Christmas and seeing grandpa Kelly in my bedroom with a sack of presents, trying not to be seen; I remember playing cards with grandma Nettie in the holiday evenings; waiting for the bus as a small child with grandma Kelly; grandpa Jim one day asking me what kind of girls I liked (his answer was that he liked girls who liked him, he was a clever man). I think describing something as Modernist puts many readers off, partly because it promises difficulty and partly because it makes it sound rather grand and austere. You perhaps have stream of consciousness which many dislike, though it’s not a necessary technique and it’s not one that’s used here. Jacob’s Room is closest if anything to an impressionist painting. 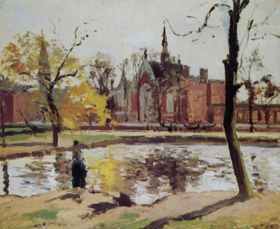 It puts conventional narrative techniques aside to a degree, but no more than say Pissarro did the same with conventional painting. If you’re not daunted by Pissarro there’s no particular reason to be daunted by Woolf, or at least not by this Woolf. The Scilly Isles were turning bluish; and suddenly blue, purple, and green flushed the sea; left it grey; struck a stripe which vanished; but when Jacob had got his shirt over his head the whole floor of the waves was blue and white, rippling and crisp, though now and again a broad purple mark appeared, like a bruise; or there floated an entire emerald tinged with yellow. He plunged. He gulped in water, spat it out, struck with his right arm, struck with his left, was towed by a rope, gasped, splashed, and was hauled on board. Moments later Jacob loses overboard the copy of Shakespeare’s works he’s been reading, the pages drifting apart in the water. It’s a moment you could easily read considerable symbolism into, but it’s also the sort of minor accident that life is filled with. As Woolf says later in the text, “the observer is choked with observations.” Everything here seems meaningful, but only because it’s been singled out to be shown when so much is left out. Woolf places Jacob among his peers; showing idle conversations in Cambridge rooms, arguments and affection. The young men shine, their beauty illuminated by Woolf’s gaze. Jacob himself seems to have shifting futures ahead of him, all the things he could become. He has the potential to one day be a writer, a scholar, perhaps a statesman. The classic Bildungsroman makes its hero’s story arc seem inevitable, but after the Great War it must have been miserably apparent how remorselessly contingent our lives actually are. Jacob and his friends are washed away, made generational flotsam by others’ carelessness. It is no use trying to sum people up. One must follow hints, not exactly what is said, nor yet entirely what is done. Some, it is true, take ineffaceable impressions of character at once. Others dally, loiter, and get blown this way and that. Kind old ladies assure us that cats are often the best judges of character. A cat will always go to a good man, they say; but then, Mrs. Whitehorn, Jacob’s landlady, loathed cats. In what becomes another subversion of the Bildungsroman genre, it becomes apparent that Jacob isn’t necessarily particularly exceptional. He’s a young man of his time and situation. His thoughts aren’t shown to be especially insightful or original, his undergraduate passions and enthusiasms are precisely that, undergraduate. He’s important mostly to his mother, but then so are most of us. He matters, because people matter and because there are people he matters to. Kill Jacob or any of his generation at 80 and his potential would be fulfilled (or wasted, which is still a form of completed narrative), his path made inevitable by hindsight. Kill him at 20 and all we’re left with is an absence, a space where a person should be, a room that used to be his filled with objects made irrelevant. Anthony of Time’s Flow Stemmed wrote an entire blog post on the first paragraph alone, which can be found here and which is worth reading as he draws a fair bit out of it (but without in my view reading too much into it). Anthony writes a little more on the book more generally here. Novelist Jonathan Gibbs reviewed the book as part of his reading of Melville House’s Art of the Novella series, his thoughts are here (though why Melville considered this a novella is utterly beyond me, I don’t see any sense in which it is). Anthony also linked to this tremendous review from a blog previously unknown to me which is very much worth reading.